After meeting your guide at Pike Place Market, your tour starts with a little Seattle history as you travel through Pioneer Square, where the early settlers decided to build the city. Then head to Snoqualmie Falls in the Cascade foothills. 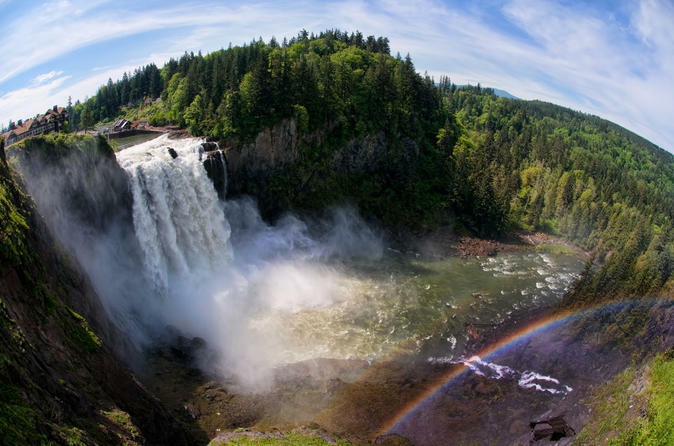 Drive through the town of Snoqualmie before taking in the natural beauty of Snoqualmie Falls, where you have 30 minutes to admire the scenery and take photos. Returning to the city, explore some Seattle neighborhoods and music history. Then stop for photos at the Fremont Troll, a piece of public art, as well as other sights in the Fremont neighborhood. Next, visit the Ballard Locks and see Fisherman's Terminal. This is a half-hour stop where you'll observe maritime traffic as boats navigate this engineering marvel. You may even see migrating salmon going through the locks system, as well as sea lions, eagles, and great blue heron. From October 29th thru March 1st, we do not stop at the locks due to the lack of boating activity and an empty fish ladder. We extend the time at Snoqualmie Falls and include additional sightseeing areas including the Amazon Spheres. From here, continue up to Kerry Park for one of the best views in Seattle. Snap photos of the skyline and Mt. Ranier, depending on the weather conditions. Arrive back at Pike Place Market to end your tour. During your tour, bottled water and a light snack are provided, and as an added bonus, receive simple photo tips to help you take postcard-perfect shots during the rest of your vacation.